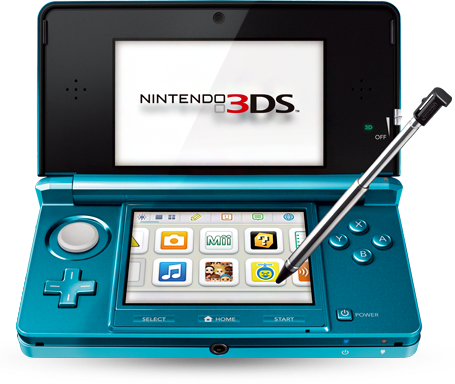 The Nintendo 3DS has officially been alive for one year in North America. Huzzah! The launch period was mighty rocky with third parties quietly canceling games, sales meandering into the mediocre, confusion over whether the 3DS was a new system or an upgrade to the Nintendo DS line of products, and gamers screaming for more quality titles for their personal libraries. Nintendo somehow managed to turn it around. Sure, it only took a massive price cut, two mainline Mario games, and twenty free games for Ambassadors, but they did it. I think it's high time for an another edition of RE:. This is where I take a game or product and look back on it. Perhaps my opinion has changed since my original hardware review. Perhaps not. We'll find out with this installment of RE:! The build of the Nintendo 3DS is very much akin to its predecessor, the Nintendo DS. It is a dual-screened beauty that comes in black, blue, red, or pink in North America. There have been many reports of the bottom screen scratching the top screen when the system is closed. I know that when I have the system closed for extended periods of time, the Circle Pad rubs against the top screen and leaves an imprint of itself there. I use the plastic sheet of paper that came with the hardware to sandwich it between the two screens when the system is firmly shut. That prevents scratches. You can never be too careful with new tech, right? This blue Nintendo 3DS is one of the better colors to look into. For me, the 3DS is just about the right size. My hands fit comfortably around the unit. To the left of the bottom touch screen are the d-pad and the Circle Pad, a nub that is of much better quality than say the PSP's. It is easy to maneuver in three-dimensional games. To the right of the bottom screen are the A, B, X, and Y buttons. Now, not everyone can view the system's auto-stereoscopic 3D or aren't old enough to be advised to. In that case, you can adjust the 3D slider found on the right side of the top screen to a suitable level. If the effect is to pronounced, you can simply lower the slider at your leisure. Turning on the 3DS, you realize after a good three or four hours of playtime that the system needs recharging. The battery life of this and Sony's PlayStation Vita are woefully short. Another problem that some people view the system has it that there is only one Circle Pad. This makes some games challenging to control with only one nub and face buttons for camera movement. Some are awaiting a revision with not only a second Circle Pad (you can use the makeshift solution the Circle Pad Pro which hooks up to the back of the hardware), but they are biding their time for a system with better battery life. I personally want a 3DS that isn't a fingerprint magnet, so I'd desire a matte finish to the system. I like the menus of the 3DS. The different icons which are lined up in rows and/or columns can be arranged to your liking. What I would like to see is the ability to have folders so I could put Virtual Console games in a specific folder, 3DSWare games in a specially marked folder, and so forth. The 3DS comes with an abundant array of content already inside the system. (It also comes with your own SD card to save data and games on it. It has a lot of room for storage, too.) There's the prepackaged AR cards that can be used to play a flurry of augmented reality games like fishing and a billiard-like title as well as taking pictures of Nintendo's lineup of all-stars such as Mario, Toon Link, and Samus Aran, for starters. To play these games, you take an AR card and put it face up on a table, desk, or other flat surface. You then allow the 3DS time to read the card, and then bam! There it is in the 3DS's top screen. Face Raiders is the type of AR game that does not need an AR card to play it. Instead, you spin around shooting at floating heads for points. them away in Face Raiders! ...I can't be the only one that does that, right? Miis return from the Wii and DSi onto the 3DS. You can scan QR codes to have a Mii automatically generate onto your system, or you can opt to create your own Mii masterpieces. Miis that you meet via the StreetPass feature allow you to use them in the Mii StreetPass Plaza's Find Mii game. It is an RPG where you utilize Miis to rescue your kidnapped and imprisoned self. Speaking of StreetPass, this feature allows you to have your 3DS in Sleep Mode, walk around town in malls, around school campuses, and other places to have other players' 3DS systems wirelessly speak to another. You trade not only Mii info, but some games offer the ability to trade game content. In Mario Kart 7 you trade ghost data while in Super Street Fighter IV: 3D Edition your figurines battle against one another. 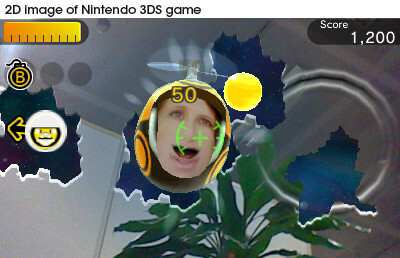 There is also SpotPass which is an online means to communicate between 3DS systems. One of the greatest examples of SpotPass is the free-to-download program Swapnote, known as Nintendo Letter Box in PAL territories. This is a creative way of messaging people on your friend list by drawing and writing notes with your stylus. You can choose various stationery, receive notes from friends and Nintendo, and have a gay old time showing off your penmanship to your buddies. 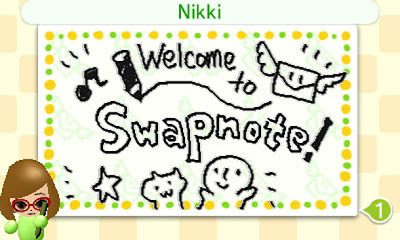 The one drawback to Swapnote is that you can only reply to a given note once. I wish you could respond back multiple times. That is my only quandary with this program. Hopefully your drawings are as tasteful as hostess Nikki's. 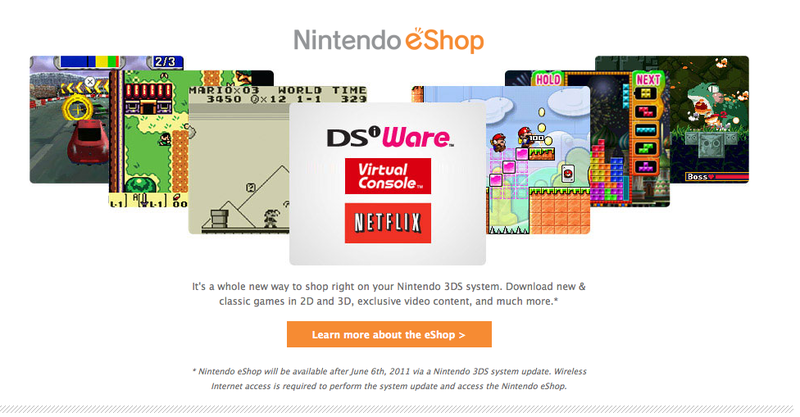 Downloading programs and games is performed via the Nintendo eShop. 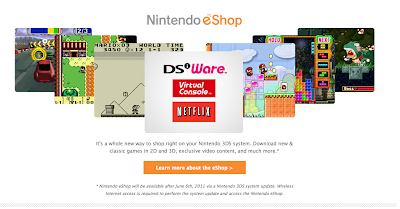 Not only can you buy and download games from the Virtual Console, but you can buy DSiWare and 3DSWare games like Dillon's Rolling Western, Mighty Switch Force, and Mutant Mudds, to name a few. You can watch trailers and videos in full stereoscopic 3D, and now you are able to download demos for titles like Metal Gear Solid: Snake Eater 3D, Resident Evil: Revelations, and Crush 3D. One of personal favorite things to do is watch North America's Nintendo Show 3D as hosted by the enchanting Jessie Cantrell. but now it is one satisfying week after another. A year later and the library of 3DS games has grown exponentially from the paltry lineup we experience at launch. There's dozens upon dozens of great titles to pick up from various genres like action/adventure, RPG, platformer, fighting, and racing. There's The Legend of Zelda: Ocarina of Time 3D, Star Fox 64 3D, Super Mario 3D Land, Tetris: Axis, Pokemon Rumble Blast, Resident Evil: Revelations, Dead or Alive: Dimensions, and so many more. Tomorrow I will list my top ten 3DS games of its first year. It is going to be an exciting list, for sure. I'm really now waiting for some games that appeal to me to be released on the 3DS. There's a real lack of strategy, and RPG on the console, and not a whole lot on the horizon to remedy that. The fact I've only played my 3DS for 15 hours for the whole of last month shows a lot, I think. I love the social features like StreetPass and the play coins. I still carry my 3DS with me daily for that, though I am disappointed that the newer games aren't really using those features. I feel like I am still playing catch-up on this system. Partially because I am so far behind on my other titles, but also because while I missed the 3DS's growing pains by not getting mine until Christmas, I have built up a pretty good backlog of games for it that I still haven't gotten through yet. I am really looking forward to several of the titles I have seen teased going forward though - fire emblem, the fatal frame title, culdcept saga, luigi's mansion 2 and others. I just got kid icarus last night, so that'll keep me busy for a bit, and I've logged a ton of time with Tetris Axis and Starfox 64 of late so I should have those impressions out soon too.